Our construction department has completed several construction and installation projects ranging from small interior build-outs to multi-level tenant high rise buildings. Construction includes commercial and industrial work, new construction and renovations. 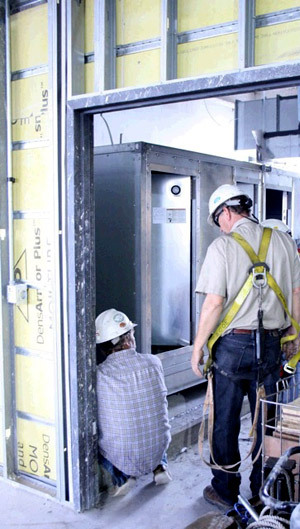 We also provide system expansions and upgrades to HVAC systems, exhaust, sheet metal, piping, equipment setting, erection and relocation. We value the many unique relationships that we have developed with owners, general contractors, suppliers and subcontractors over the years. A vast majority of our projects are from repeat clients. Our project management team, with over 200 combined years of proven success, brings to our clients the capability of completing projects within the client’s budget and schedule. Whether it is a design/build project or a bid project, our experienced team is known for our endless efforts to satisfy. The individual and personal attention our management team places with each and every project is the dedication and attention all of our clients have come to expect. © Copyright 2016 all rights reserved, Infinity Systems, Inc.